This gorgeous penannular brooch combines three of our filigree honeybees, evoking the ways honeybees cluster socially in their hives. 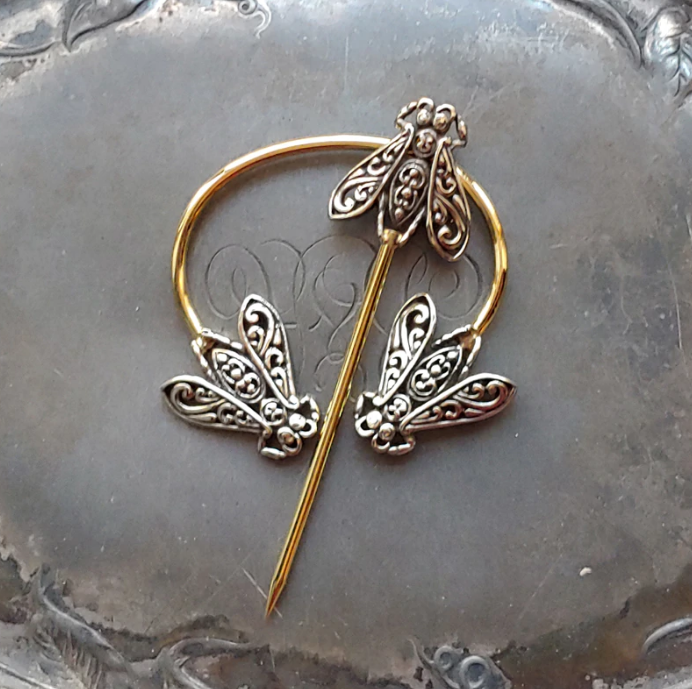 Our collection of Filigree Honeybee adornments - Filigree Honeybee Shawl stick, Filigree Honeybee Shawl pin, Filigree Honeybee Penannular Brooch, and Filigree Honeybee Clasp, are our way of celebrating the fundamental role pollinators play in the healthy maintenance of plant life on our planet and in our food supply. The ancient one-piece design of the Filigree Honeybee Penannular Brooch makes it an elegant and secure shawl and garment closure.